The race gets its name from the three mountain tops the 38 mile course traverses. 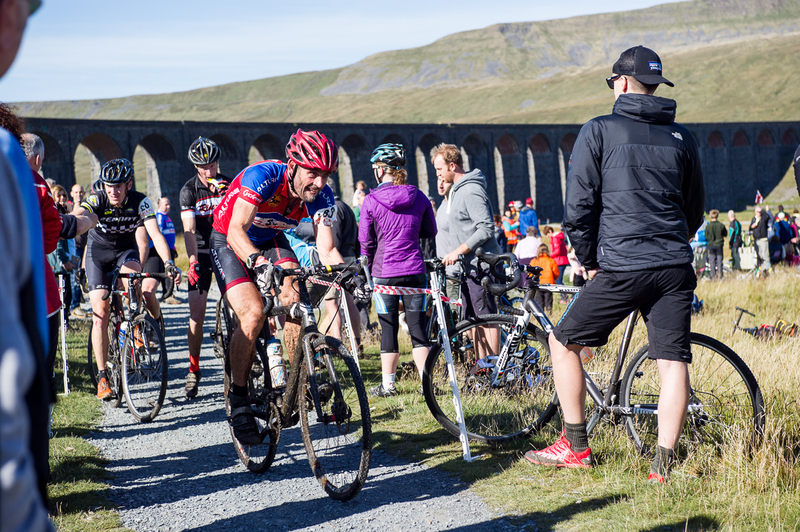 650 competitors first struggle up the 45 degree ascent of Ingleborough. Their bikes flat across their backs, grabbing handfuls of grass to steady themselves. 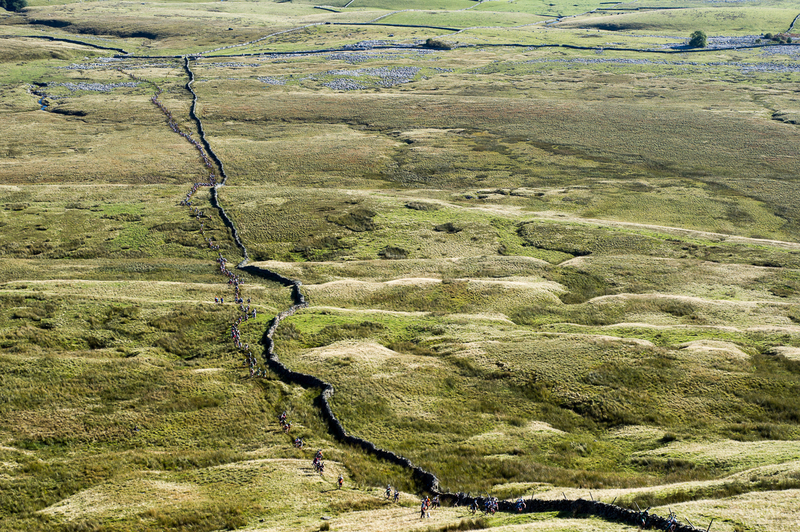 To reach the second peak, Whernside, they must cross the exposed high moors. When the weather is bad, this stretch can be wind blasted and hub deep in mud. 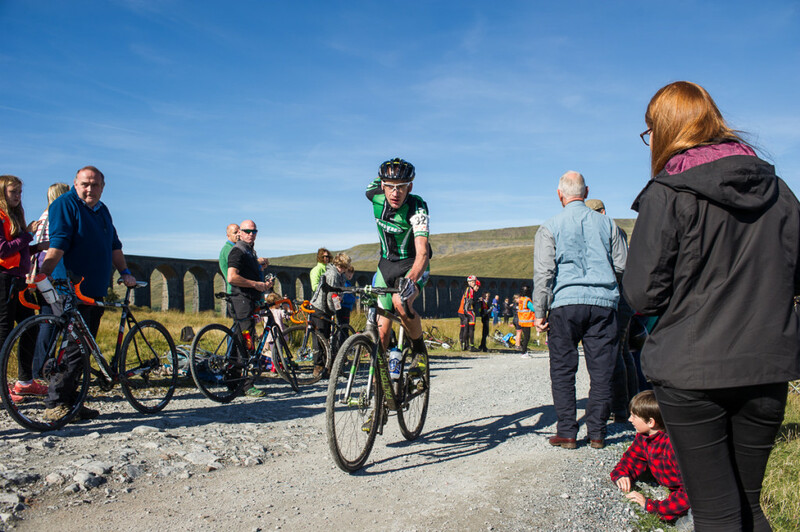 Whernside is known for it’s very fast descent over granite slabs, rocks and rain gullies. The final peak, Pen Y Ghent is at a lower elevation, but with so much running (if you want to win) or trudging (if you want to finish) in the legs already, is often the toughest. Helwith Bridge, is a small North Yorkshire town, and the start town for Three Peaks. It has a few houses, a pub, and a bunkhouse. The dormitory beds in the bunkhouse are mainly taken by Three Peaks regulars and locals who’ve run and ridden in the area all their lives. They arrive by bike, eat, then sleep in their club kit, with a full brass band snoring accompaniment. 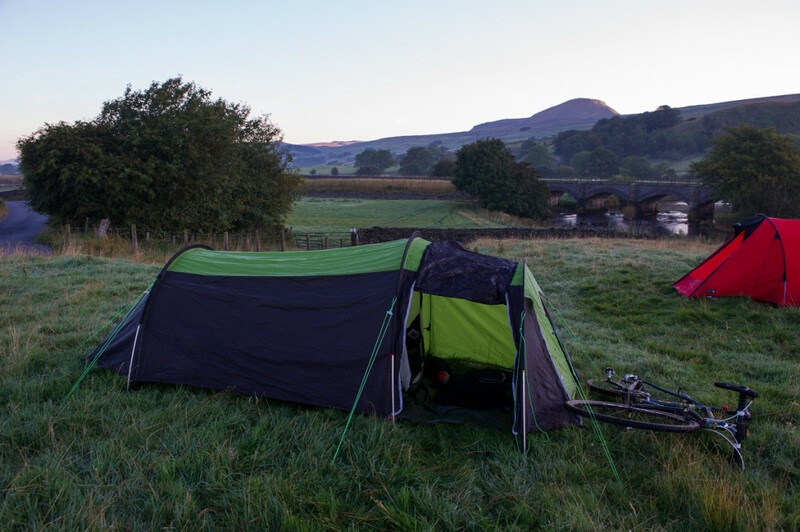 I left it too late to book the bunkhouse so was out in a tent, in a nearby field. This far North in late September, it gets cold on a clear night. In the morning there was ice on the tent and the bike. The rider sign on had already opened and the coffee and bacon tent was beckoning me from across the field. 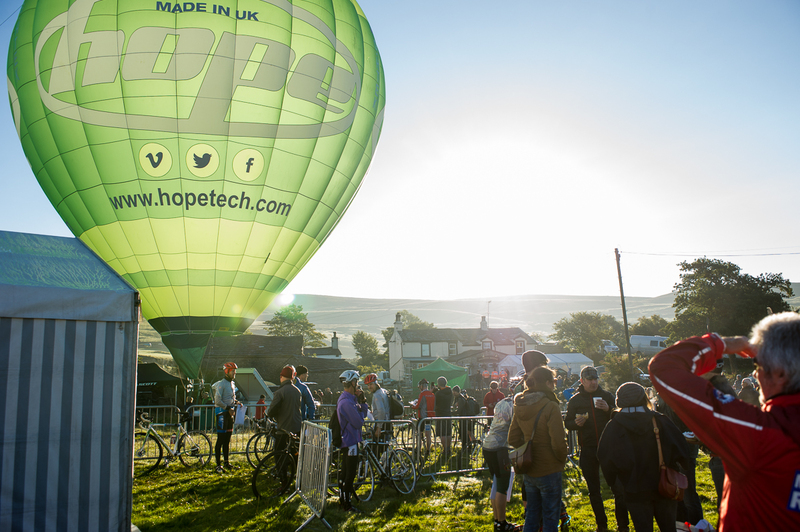 It’s several miles ride, then a very hard walk with camera kit up the first part of Ingleborough, so I left the start about an hour ahead of the race. The lower slopes are known as Simon Fell. The approach through a farm yard is boggy, but rideable, and leads to a climb of 100 of vertical metres, in 100 horizontal metres. 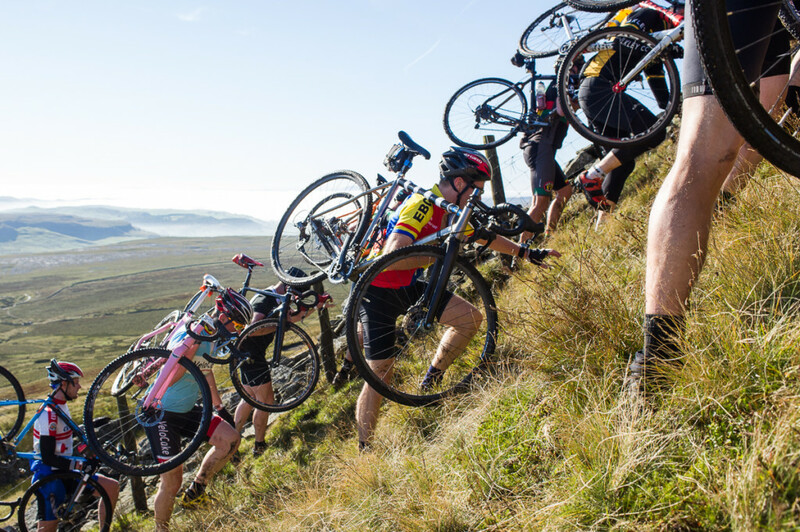 Over the years, the passage of Three Peaks riders up the 45 degree slope has worn some footholds into the mud. If you know where to find them, they can make all the difference. It takes about ten minutes for the field to pass, in silence apart from their heavy breathing. Once they have gone it’s a short ride from the foot of Ingleborough down the road to my next vantage. Of all the things I’ve done on a bike, rolling across some farmland back to a main road is amongst the least reckless. (I once found myself on a traffic free Gavia. In my excitement and over exuberance I very nearly went off the side of it. That was the most reckless.) I rode up a grassy mound, which on closer inspection, (i.e. too late to stop) turned out to be half a grassy mound, with a two metre vertical drop on the other side. 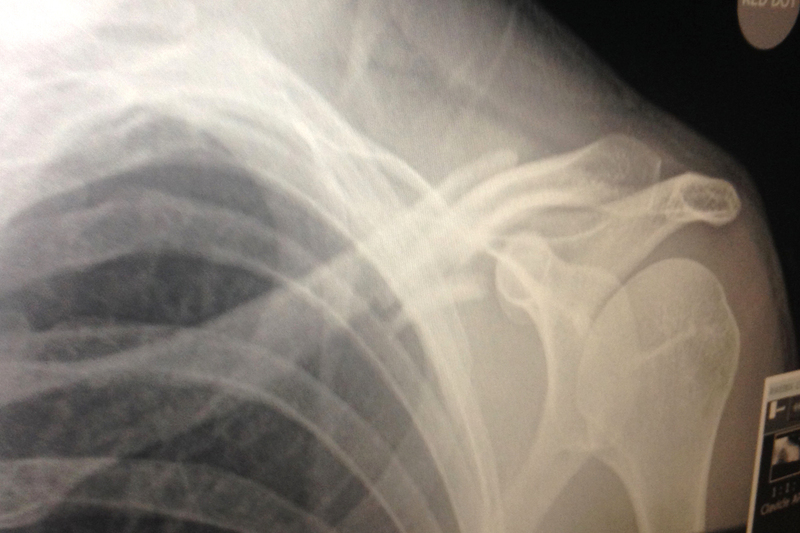 Over I went, landing on my shoulder and smashing my collarbone. I got up and rode for a bit because I wanted to pretend I was fine, like on the TV, but I clearly wasn’t. Everyone from this point was super kind. Thank you to the people who made sure I was looked after, and made me as comfortable as possible. I got a lift from ace MTB photographer Sam Needham (thanks again Sam) to find someone who could offer more medical expertise than my ‘It feels a bit crunchy’ diagnosis. Then a lift with a fellow collarbone cripple, who’d come off on a road section, back to Helwith Bridge. 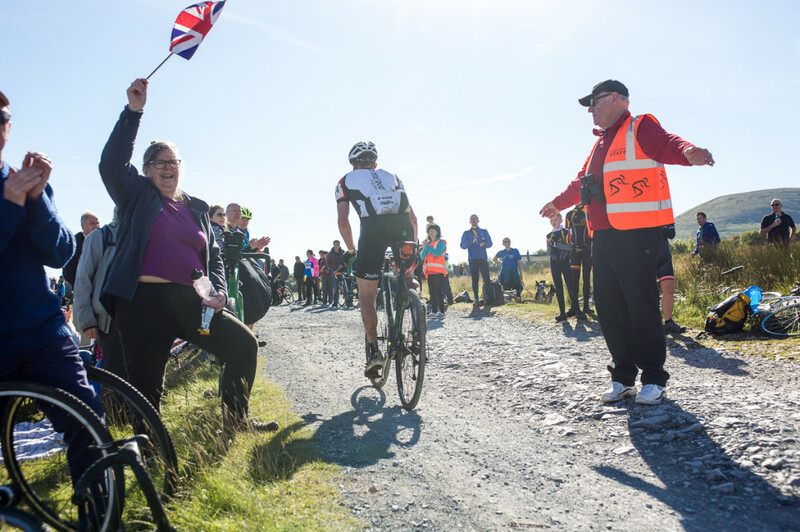 The cycling community reserves a special sort of gallows humour for anyone pushing a broken bike and wearing a sling. The conversations I have walking from the van all follow the same pattern. They start with a specific tone of amused, but sympathetic laughter. The laughter you use when someone drops their toast butter side down. ‘You done that today?’ Yup. ‘Collarbone?’ Yup. ‘That’ll hurt that. Sleep sitting up. Buh bye.’ I also got two ‘Ow’s the other fella?’ and one very gentle hug from an old lady I have never met. The race itself kind of went over my head, but was one of the closest fought for years. 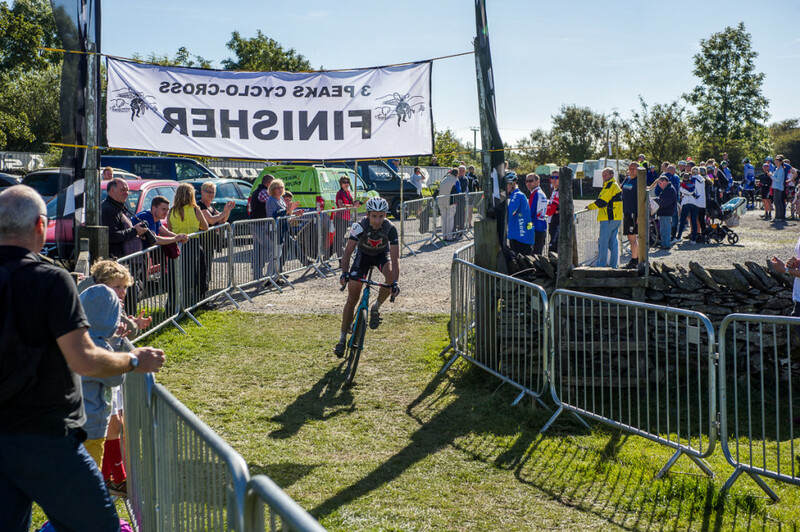 Paul Oldham beating eleven times winner Rob Jebb by just over a minute with a time 2 hours 59 minutes.